Marigold PEACOCK TAIL & DAISY 9 in. Bowl. 9.5 in. diam. made for Levay Glass. 9 in. 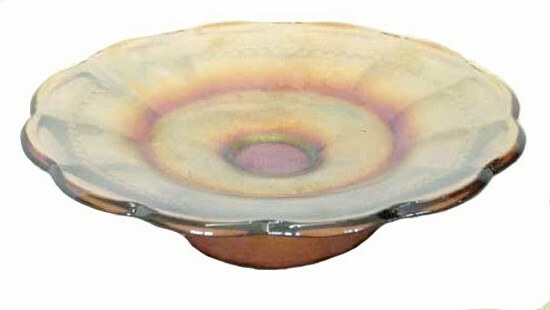 Bowl - Sold for $1100. with base chip - L.L. Conv. Exterior - Blue Opal PEACOCKTAIL and DAISY. 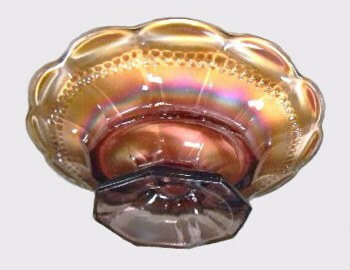 PEACOCKTAIL & DAISY: First time I saw this bowl along about 1984, it was in a window display during a Northern CA. Convention held in Sacramento. “It’s right up the alley” for a pattern “chaser” like me, (Diane) and was magnificent marigold; an absolute “must have” in every way!....However, it had already been spoken for by Don Moore! In those days, there was a certain “line of seniority” in obtaining any of the unusual pieces. In today’s world, those willing to spend the most money dictate ownership. 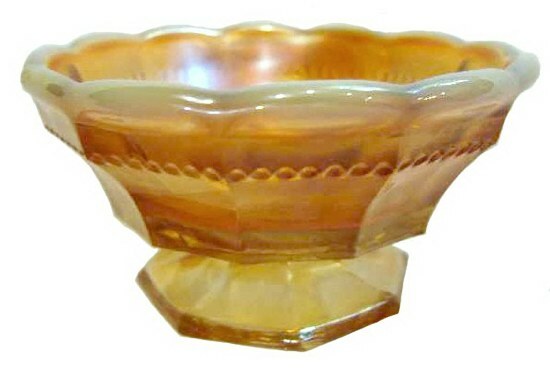 While not of Fenton manufacture; according to inspection and study by Frank M., himself, it remains one of the RAREST of bowls in all of Carnival Glass. Not as rare as the Fern bowl, but more-so-than Dragon’s Tongue, Little Daisies or Rose Tree. Three are known in amethyst, and one in blue opal is in a prominent collection in Wisconsin. All-over designs are captivating, and considering the “involvement” of yet another Peacock Tail, this (in our humble opinion) is a supreme entity – in every sense of the word! One example of this pattern is worth six of those “other Peacocks”……….you know…….the ones on the fence? 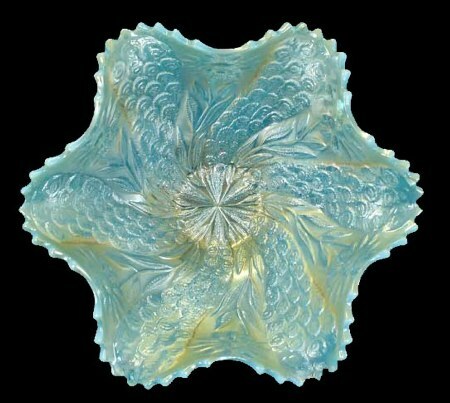 John Britt studied and discussed this piece with various prominent collectors who all seemed to agree that this marvel of design was handed to us by WESTMORELAND Glass Co. They certainly “did it right”. 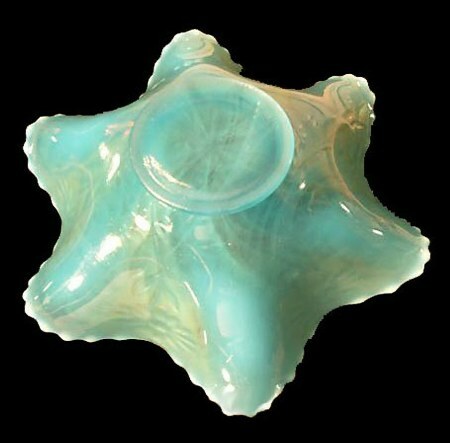 Note: A blue opal example appeared for sale over eBay in late May 2009. It had a chip on one ruffle edge. Following 35 bids placed by 12 bidders, it sold for $787.77 with shipping cost of $9.95. Left - LITTLE BEADS Compote - Amethyst. Right - Marigold LITTLE BEADS Compote, 5 in. wide x 2 in. high. Westmoreland LITTLE BEADS 5 in. Plate - Amethyst. LITTLE BEADS: A single line of beads encircles this 8-fluted exterior. The interior is un-patterned. 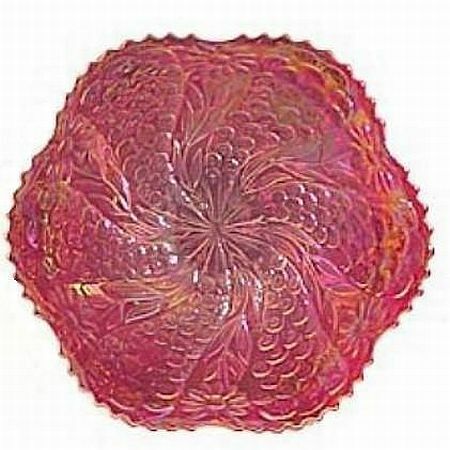 Certainly not plentiful in the overall scheme of things, the flattened plate in amethyst is considered a rare whimsey which brought only $55 in the mid-‘90s. 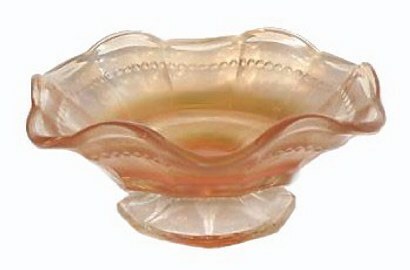 The compote shape is widely spread open to about 5 ½” across. Known colors: Amethyst, amber, teal, and peach opal. ESTATE Breakfast Set in Blue Opal. ESTATE Covered Trinket Box - Courtesy Remmen Auctions. 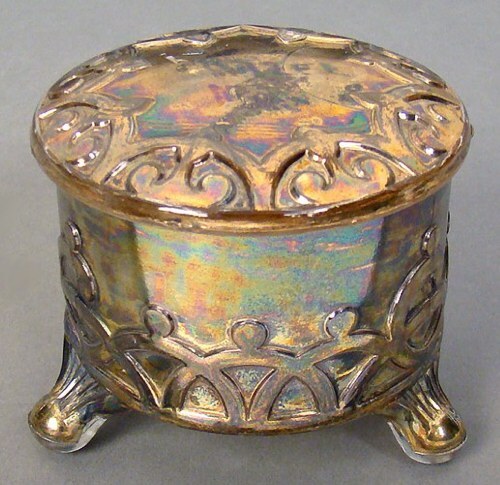 ESTATE (Covered) Trinket Box: These covered powder boxes are extremely difficult to “come by”! 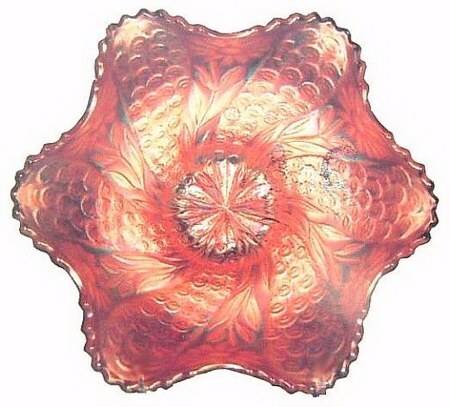 Standing 2” tall, with a 2 3/8” diameter, they may not command much attention from collectors, but should you decide to own one, you should be prepared for a very long search. They are more often than not in smoke color and to find one with lid creates a real treasure! ESTATE Mug in Mgld. - Courtesy Remmen Auctions. 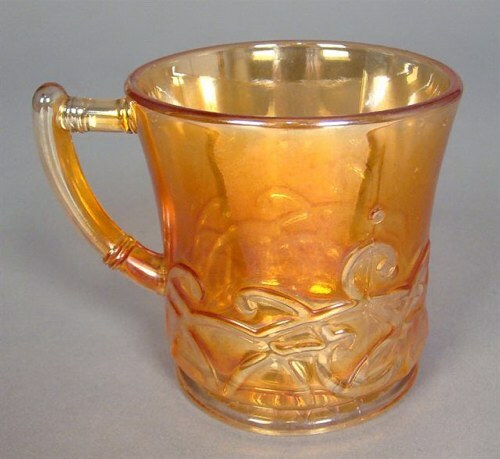 ESTATE Mug: The marigold is spectacular on this piece! Shapes in this pattern do not present themselves very often. It would require many years to obtain the prime colors of marigold, blue opal and peach opal. ESTATE Toothpicks in Smoke and Peach Opal or Marigold. 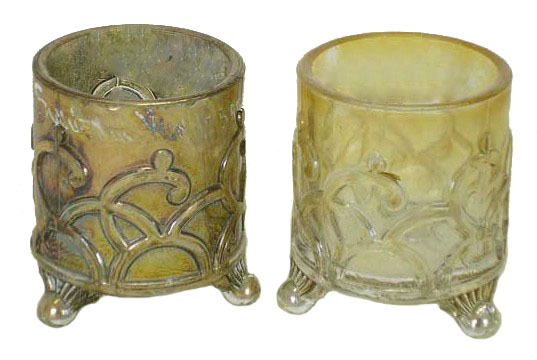 ESTATE Toothpick Holders: These have been seen having “gold flash”. Usual colors are light marigold, smoke and peach opal.